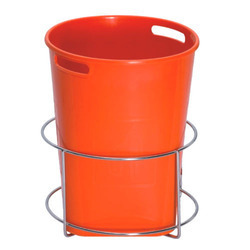 Our organization is widely acknowledged in this domain as the leading manufacturer of Bin Holder. 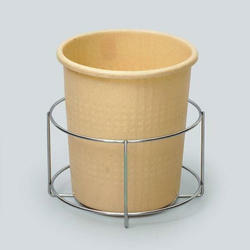 We are one of the leading manufacturer & exporter of Special Dustbin Holder. These Bin Holder are made from very high quality stainless steel raw material which ensures high durability at its user end. These Bin Holder are available in various designer patterns and designs. To retain our goodwill in clients' consideration, we are manufacturing an excellent range of Kitchen Bin Holder. This specific product Bin holder has been designed in a classic style and helps in mass storages, such as tea, coffee, sugar & biscuit, kitchen utensils and many more. It has additional features like its clean, straight lines with squared end-caps & feet and the steel frame support ensures for a longer life span period. It is very user friendly due to its dimension and size. Usage: clips on any drawer or cabinet in kitchen, bathroom,etc. for convenient, hands-free waste Disposal. This specific product Bin holder has been designed in a classic style and helps in mass storage, such as tea, coffee, sugar & biscuit, kitchen utensils and many more. It has additional features like its clean, straight lines with squared end-caps & feet and the steel frame support ensures for a longer life span period.